Before air conditioning became widespread, the screened porch was considered a necessity in many areas as a respite from intense heat, especially as a safe, cool place to rest at night. 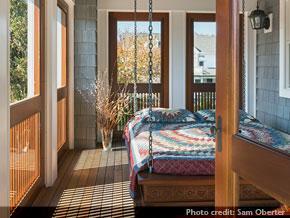 Screened porches provide their greatest enjoyment when they take advantage of nature, light, and views. 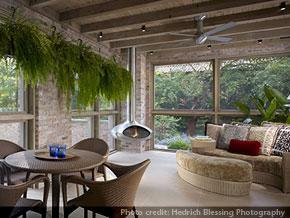 This screened porch in a Chicago suburb was designed by architect Allan J. Grant as part of a new addition to an existing home. It was designed to be practical and inviting and fit the look of other rooms in the house with its large format porcelain tiles, exposed brick walls, and rough-hewn wood-clad beams. The wood-burning ceiling-suspended fireplace, called “Fireorb,” can rotate to orient toward different seating groups. The ceiling fan is from The Modern Fan Company. Now the screened porch is re-emerging with gusto on different styles of homes, in a wide range of prices, and all over the country, from warm climates to cold. In northern Minnesota, just below the Canadian border, builder Matt Balmer’s Lands End Development company builds mostly vacation homes. “We’re finding that consumers want them in their new houses without exception, [and] are also adding them on to existing homes,” he says. The floor-to-ceiling screens open the vistas wide but still keep out the bugs. 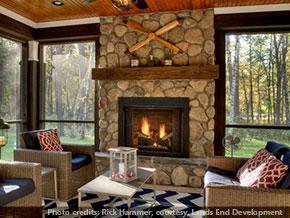 And fireplaces keep the rooms cozy as temperatures dip since most of its homes are located in northern Minnesota. In much warmer San Antonio, many of Lake Flato Architects’ projects, mostly new homes, include at least one and sometimes two screened porches. “We love how they expand clients’ living space to enjoy morning coffee or watch a sunset with a cocktail,” says Rebecca Bruce, an architect and associate with the firm. Home owners in Silver Beach, N.J., asked for a screened porch that would capture the beautiful ocean views and breezes. Architect Richard Bubnowski decided to build the porch on the southeast corner of the house so the space could take full advantage of the natural light. It is also conveniently located at beach level so friends and neighbors can stop by for an informal visit. This time around heat is not the only impetus. It’s joined by bugs and the serious health issues they bring.Mosquitoes represent the number one pest concern for home owners because of the Zika virus. Yes, even the screens have evolved. Openings have gotten larger and the mesh finer, both reflecting a contemporary influence. Designers are also working to minimize pieces that frame and support both screens and room structure. The porch was located at the quietest part of the property and by taking full advantage of the sun, this space can be used year round.